The apartment is 2 bed roomed with 2 bath rooms. Kitchen is well equipped. Large sun terrace and Wifi included. 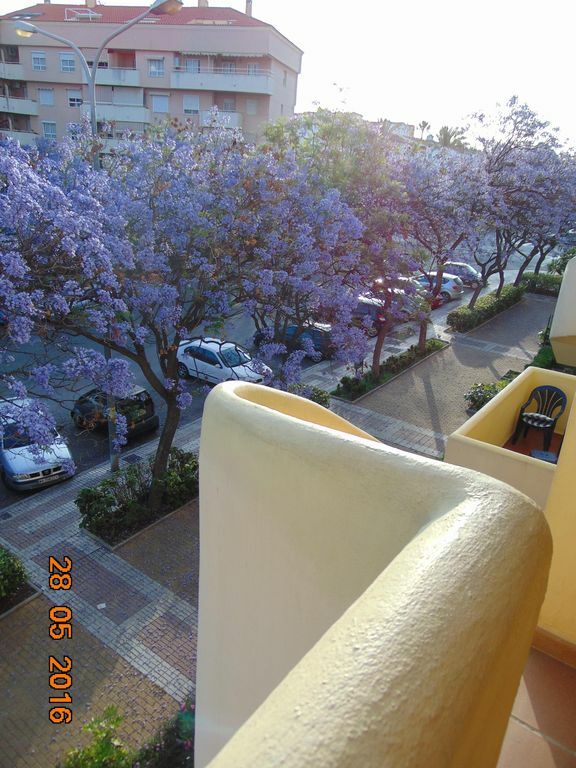 A well respected and beautifully maintained apartment, which is a short drive from Malaga airport and close to Arroyo train station. The apartment is only a 10 minute walk to the beach and close to Paloma Park. The charming village of Arroyo is a 10 minute walk away where all types of shops, bars and restaurants can be found. Tivoli World theme park and Selwo Marina are both within walking distance. Market day in Arroyo is on a Friday and beautiful Paloma Park can be found at the end of the street. There are a large choice of activities to suit all ages. A little bit about me! My late husband and I bought this apartment in 1997, after previously selling a smaller one in the same area. We and our family loved the area so much we spent our holidays there for nearly 30 years. However I lost my husband some years ago and due to ill health cannot travel as much as I would like to. I have this beautiful second home, it is a shame for it not be used, so I was recommended to holiday let it, and let more people have all the benefits of sunny Spain. If you require any further information, please don't hesitate to contact me. regards, Ann. We love this area, because you have everything to hand, and we have never grew tired of the same place. As I used this as my second home for my family and I, it is like a home from home. I hope you like it as much as we all do. Family bathroom with with shower,wc sink and bidet. En-suite bathroom linked to master room with shower, wc sink and bidet. Living space -leather 3 seater and 2 seater sofas, Tv, air-conditioning unit and dining area with with table and 4 chairs. Air-conditioning wall unit which can be used as heater in cooler months. The Sierra Nevada mountain range only 2 hours way. Costa del golf, and the del sol is known by. Some fabulous, award-winning golf courses a few mins drive from the apartment. Notes on accommodation: There is a 32" LCD Television with new internet british channels.now available and FREE wifi INTERNET access Outside: As the apartment is on the 3rd floor. (no lift) it has 2 terraces. Main terrace and a roof terrace accessed by a spiral staircase. which has spectacular views to the mountains and looks out over the Mediterranean, plus the swimming pool and gardens. Cleaning / Towels / Linen / Maid service: All linen and towels provided. Beach towels not provided. Apartment cleaned on changeover only so you have complete privacy during your holiday. Other: front entrance of apartment accessed by security gate with intercom. gardens and pool are accessed by gate & key to make sure that pool area is kept private. The closest beach in Benalmadena is only 10 mins walk away from the apartment. All beaches of Benalmadena, Torremolinos and Fuengirola are clean, safe and well kept. Water sports & Sun bed hire available. A number of beachside restaurants serving all types of food we speciality fish and seafood. Also has a beautiful promenade you can walk for miles. Malaga airport is 10-15 mins drive away, about 25-30 euros in a taxi. Train direct from airport into Benalmadena/Arroyo de la Meil with a short walk down to apartment and is only about 2 euros. The town of Arroyo de la Meil is only a few mins walk away with a good array of shops, bars and restaurants. Benalmadena Pueblo is a short drive or bus journey. a typical Andalucian white-washing village. Torremolions and Fuengirola are only a few stops on the train. Benalmadena/Arroyo station is 10 mins walk with connection to Malaga town centre and the airport. Organised coach trips to Seville, Granada, Gibralter, Mijas, Ronda. Benalmadena Costa has excellent bars, night clubs and nice restaurants. Paloma Park is within walking distance and is beautiful to stroll around, there is a large lake with all kinds of wildlife to see. Sealife centre is home to sea lions and selwo dolphins who perform there daily. this is a must. Fishing trips are available from the Marina and the port of Fuengirola and their are also daily boat trips from the marina.